Marijuana: Will Legalization Create an Economic Boom? When Oregon begins the first legal sales of recreational marijuana on Oct. 1, I'll be thinking about my Dad. He's a major reason I became a state lawmaker and have been helping implement Oregon's new marijuana law. During the 1980s recession, Dad stopped taking a salary at the family rock crushing business. It was the only way he and my uncles could keep M.C. Lininger and Sons afloat. Mom warned that if the business closed, we might have to leave the Rogue Valley, where our family has lived for generations. Southern Oregon's economy was withering, and in many cases, the jobs never came back. Now that's changing, thanks to Oregon's new marijuana law. Legalization will create a jobs boom in southern Oregon, one of the best places in the world for outdoor marijuana cultivation. Taxes collected will fund public services. The criminal market will hopefully be pushed out. Few states have done this before, all of them have had problems, and there's no perfect model. How do we implement our new law in a way that pushes out the criminal market, contains marijuana's risks, and limits its environmental impact? All eyes are on Oregon. If we get it right, we can show the rest of the country that legalization works. Southern Oregon could become for marijuana what Napa Valley has become for wine. As kids, my cousins and I rode down Main Street in Ashland's 4th of July parade, perched on the edge of a truck from our family's rock crushing business, tossing out packets of candy that looked like gravel. But in the 1980s, the economy was a wreck, especially in the natural resources sector. Forty-eight thousand jobs in the Pacific Northwest lumber industry had been chopped down, and lots of related jobs disappeared with them. Lumber prices plummeted as unemployment spiked. We learned from that deep recession. Oregon needs a diverse jobs base. As city councils and county commissions in Oregon -- and, soon, across the country --decide whether to allow legal marijuana businesses, they should keep in mind that legal marijuana offers a new way for people to earn a living from the land. Oregon already has been producing high-quality marijuana for decades. Our market is valued at $1 billion a year. Now that legalization is happening, more of the marijuana sales are likely to occur on the legal market and the opportunity for growth is enormous. Our country's legal cannabis sector grew by 74% in 2014, according to ArcView Market Research. Once the rest of the United States legalizes, the sector should grow to at least $36 billion. That's larger than the organic food business and, very likely, would mean millions of jobs. What will the market look like? I want the legal cannabis sector to complement Oregon's thriving craft beer and wine industries. I want it to offer workers dignity, living wages, good benefits, and a role in shaping their future. On the jobs front, we're already making progress. In July, United Food and Commercial Workers Local 555 announced its first-ever union contract for an Oregon marijuana business. Workers at Stoney Brothers start at $15 an hour and get paid leave and a pension. Meanwhile, Women Grow Portland is having tremendous success helping female cannabis entrepreneurs. This is crucial in a state where only a third of businesses are owned by women and nearly one in three working single mothers lives in poverty. The jobs are being created. Now it's time to scale up. Although we voted to legalize marijuana, many of us worry it paves the way to dangerous behaviors like impaired driving. I'm working with my colleagues to make sure law enforcement gets appropriate support to keep the roads safe. We must also help owners of legal marijuana businesses access banks, which are reluctant to work with companies that deal with a Schedule I Controlled Substance. Right now, marijuana dispensaries and growers often end up with towers of cash they can't deposit. It's catnip for criminals. Congress should follow the lead of Oregon Congressman Earl Blumenauer and immediately reschedule marijuana so marijuana businesses can more easily get bank accounts. In addition, Oregon must welcome outside investment and expertise. Marijuana entrepreneurs need capital to scale up. We should encourage investing in Oregon businesses. Although regulators should insist on background checks to stop criminal groups, we should avoid extreme investment limitations and residency requirements. Misguided protectionism will stunt the growth of emerging companies, making it harder for Oregon businesses to compete in the legal national market that is coming. We should let market forces work, coupled by reasonable tracking and reporting requirements to prevent diversion. Finally, Oregon must contain marijuana's environmental impact. Marijuana production can consume lots of energy and water. Indoor grow operations, for example, use eight times as much energy per square foot as most commercial sites. Some plants require six gallons of water a day. Those quantities add up. States that have started exploring this business have seen serious spikes in energy and water use. We have a responsibility to conserve. Fortunately, the legal market is easier to regulate than the criminal market. The newly established Task Force on Cannabis Environmental Best Practices that I'm part of will study approaches from other states to see how we might use incentives and surcharges to encourage energy efficiency. We will do similar work to address water use. Oregon will have a forward-thinking model that protects the environment. You can't do that under prohibition. The to-do list may seem daunting, but Oregon is on track to set an example for the rest of the country -- and help families like the one I grew up in. Which brings me back to my dad, who is now 80, still living in the house where I grew up, in a part of southern Oregon that's prime for marijuana cultivation. I asked Dad what he thought about the budding industry. He has his concerns. --"Will the deer eat it?" he asked -- but also sees how it could transform our state. Prohibition is over. Now it's time to address our concerns and seize the opportunity. 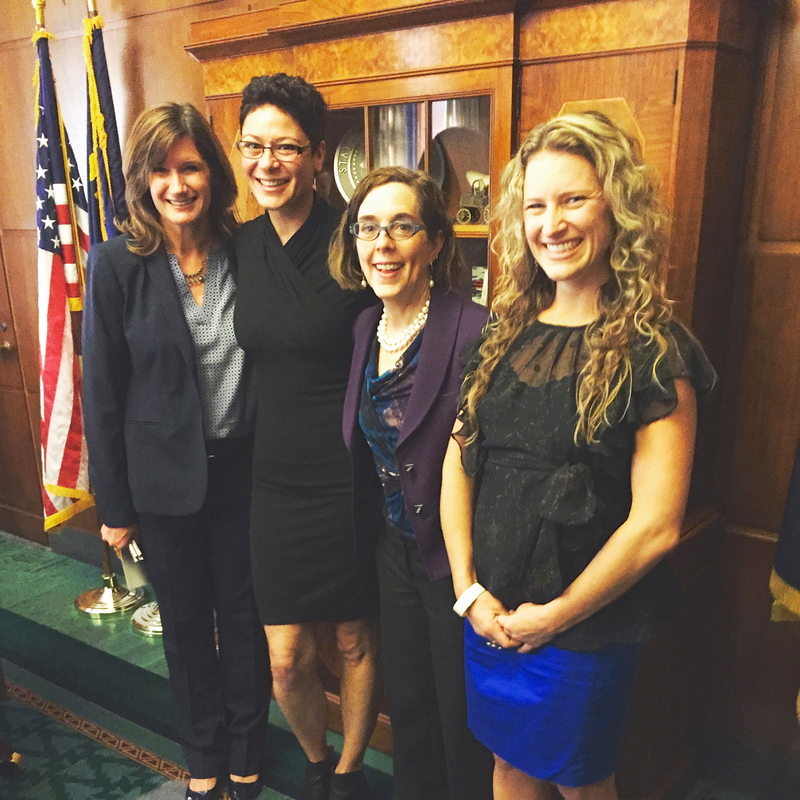 Ann Lininger, a business attorney, represents Lake Oswego and Southwest Portland in the Oregon House of Representatives. She co-chairs the Oregon Legislature's Marijuana Legalization Committee.